Gabriela Stencil is a stencil font family with a unique character designed by Antonio Mejía Lechuga in collaboration with the Latinotype Team. This font, well-suited for headlines, has features that emphasise its modern and elegant personality, inspired by the style of the 19th-century Didone typefaces. 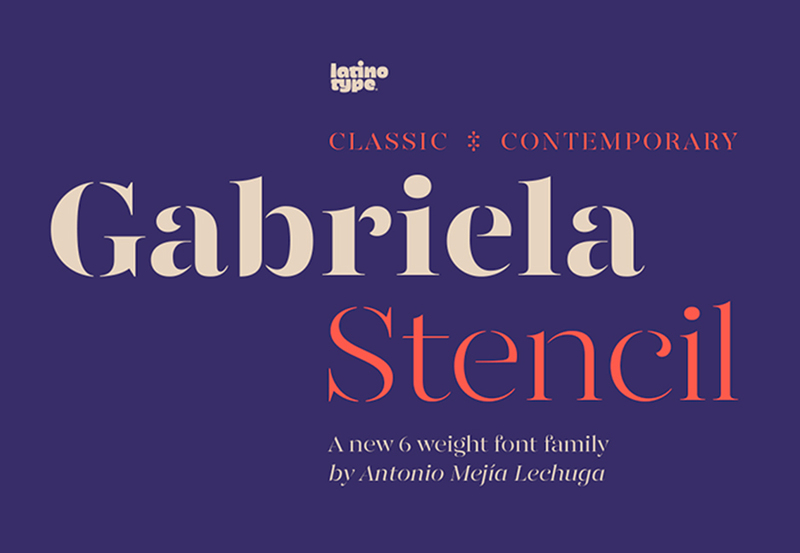 The x-height—sized at 50% of the cap height —and short ascenders and descenders make Gabriela Stencil a highly readable font and ideal for headlines, short text, branding and publishing projects. The family comes in 6 styles, from Thin to Black, plus matching italics and contains a 433-character set that supports 206 different languages. 6 weights and their italics versions. File size is approx 521KB (852KB unzipped), offered as a single download.